Ready for an eggstraordinary Easter? 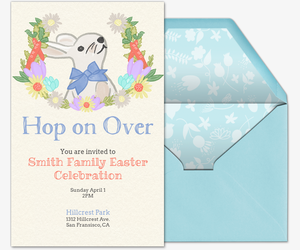 Get hopping with a digital invitation from Evite. 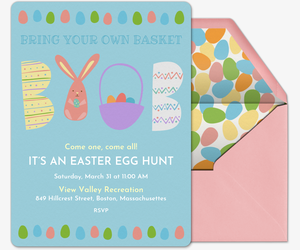 Choose from dozens of Easter-themed invitations and find one just right for your event, no matter how you’re celebrating Easter. Whether you’re arranging an Easter egg hunt for the kids, planning a brunch or gathering the local church community for an Easter Sunday morning service, our Easter party invitation gallery features plenty of hand-crafted designs to match every Easter occasion. Supply all the essential information in your custom host message, from dress code to whether your event is kid-friendly or just for grown-ups. Don’t want to do it alone? Once you’ve sent out your free e-invitation, ask your guests to contribute food, refreshments, games or eggs to decorate using our What to Bring tool. 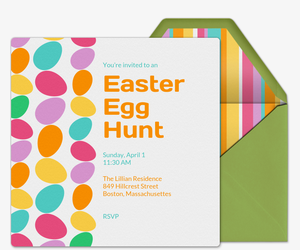 To make inviting guests exceptionally easy, send out one of our free Easter invitations. Choose from dozens of colorful designs featuring your favorite Easter icons, from eggs and flowers to cheery chicks and bunnies. Get kids excited for the festivities by sending out an Easter egg design for an egg hunt or egg decorating party. Or gather every bunny with our free “Hop, Hop, Hooray!” invitation or “Party with Your Peeps” invitation. 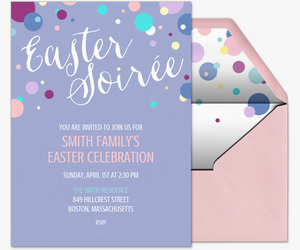 You can even create custom Easter invitations by uploading a personal photo of your choice to one of our upload-your-own design templates. 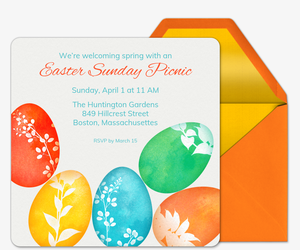 Make Easter extra special with a Premium Easter invitation. Our ad-free Premium Evite invitations come with complementary envelopes with colorful liners and custom digital “stamps”. Send friends and family our Premium “Bring Your Own Basket” invitation or our “Hop on Over” Premium bunny-themed invitation. Going to church for a sunrise service? 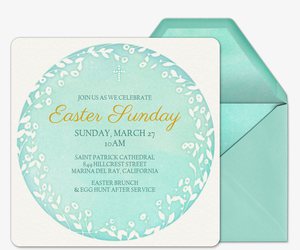 Opt for our sunrise-themed “Easter Sunday” invitation. And don’t forget you can make your own invitations using our design-your-own or upload-your-own-photo invitation templates. Spring into party planning with the help of Easter Party Ideas. Our party experts offer tips from fun DIYs to seasonal recipes for every kind of Easter eggstravaganza. Check out our party-planning guides for celebrations from Easter egg decorating parties for kids and adults to Easter egg hunts and Feaster -- the new Friendsgiving! Or head to our Real Parties section to see how people like you throw their own Easter parties, from casual brunches to rustic morning teas. Then get crafty with our Easter DIYs. Plan an egg decorating party with our no-dye egg decorating ideas for all ages, or set up for an egg hunt with our free printable signs. Or make one of our Easter-themed gifts, including DIY donut bunnies, DIY bunny bath salts, or DIY Easter baskets for him and her. Prepping goodies for the kiddos? Check out our top Easter egg treat suggestions that aren’t just candy. Happy Easter!